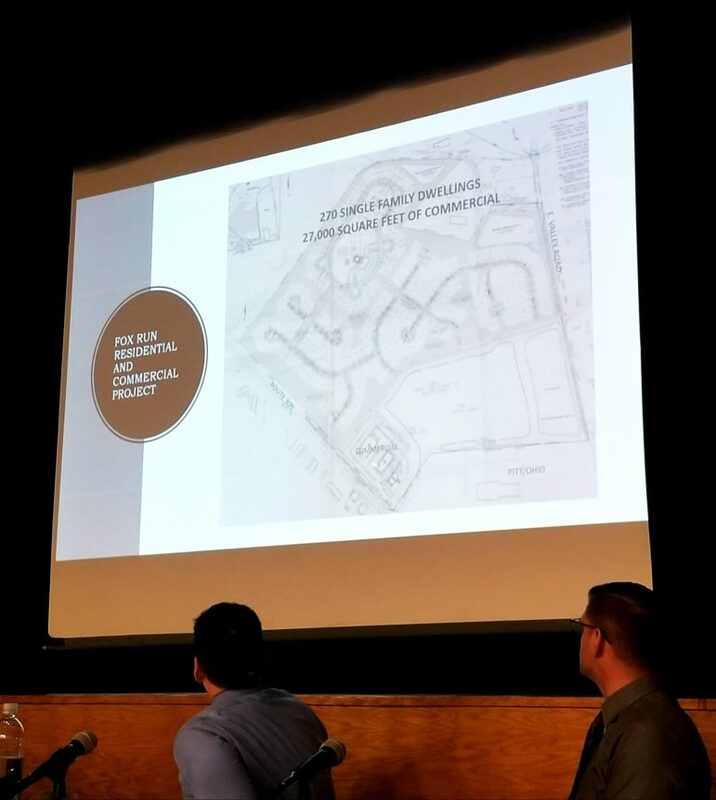 For much of the evening Upper Saucon Township residents were lined at the podium in the Southern Lehigh Middle School auditorium up to tell supervisors how they feel about a development proposal by Kay Builders. The meeting lasted approximately two-and-a-half hours. 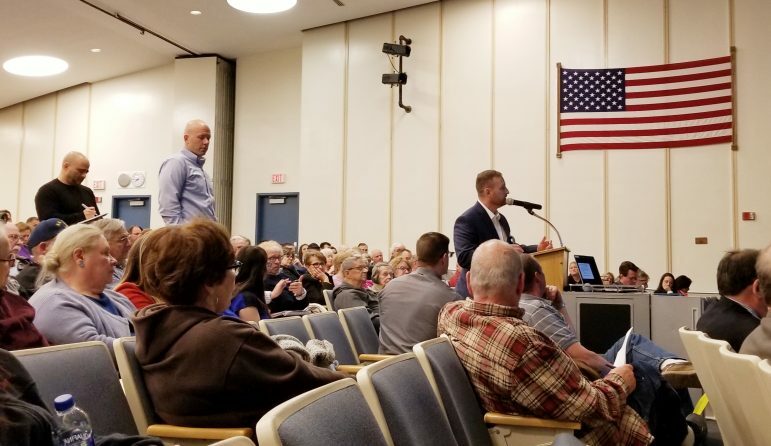 Upper Saucon Township residents packed a special board of supervisors meeting at Southern Lehigh Middle School Wednesday night to tell the board and representatives for Kay Builders in no uncertain terms that they dislike a proposal to build a large residential and retail complex along Rt. 309 north in Center Valley. More than 100 residents attended the meeting, and when one asked for an informal show of hands by those who favor the plan, only one hand went up. Upper Saucon Board of Supervisors chairman Dennis Benner speaks at Wednesday’s special meeting at Southern Lehigh Middle School. At right is board solicitor Thomas Dinkelacker. The property is approximately 119 acres in size and is bounded by Rt. 309 to the west and E. Valley Road to the east, with the PITT OHIO trucking terminal to the south and land that was formerly part of the Center Valley Club to the north, along Center Valley Parkway. Board solicitor Thomas Dinkelacker began the meeting with a property-specific timeline beginning in 1986, when the land was zoned industrial. In 2005, part of the property was the subject of an amendment which creaed an age-qualified community (AQC) overlay district, he said, and that district was expanded in 2007, which was the same year in which part of the property was rezoned from industrial to commercial. The meeting began with a presentation by board solicitor Thomas Dinkelacker about the history of the property that is the subject of the development proposal by Kay Builders. An earlier plan that would have resulted in the construction of an age-qualified community on the site was withdrawn after the economy went into a recession nearly 12 years ago. Finally in December 2007, the Upper Saucon Township board of supervisors granted conditional approval to developer DeLuca Homes to build an age-qualified community with a commercial component called Fox Run. Shortly after that the U.S. economy was plunged into a recession, and as a result the community was never built, with DeLuca formally withdrawing its plans some years later. The roots for the current proposal were sewn in 2012, when the parcel was one of a number of properties in Upper Saucon Township that were gifted to Lehigh University by the Stabler Foundation. Dinkelacker explained that Lehigh later earmarked it as a piece of land it would either sell or lease. Ultimately, that decision led to an agreement of sale with Kay Builders, which simultaneously has an approved plan to build nearly 100 single-family homes on another Upper Saucon tract known as the Bell property at Landis Mill Road and Old Bethlehem Pike. Kay has proposed deeding the Bell property–which is contiguous with Upper Saucon Community Park and contains a historic allee of tall locust trees–to the township, but only if its Rt. 309 plan which calls for nearly 900 dwelling units and 190,000 square feet of commercial space is approved. Residents and officials were critical of the lack of supporting information for the retail-residential plan that’s been put forward by Kay Builders. Preservation of the so-called Bell property which is ready to be built upon by Kay Builders was a subject that came up several times during the meeting. The area is flood-prone, several residents told supervisors. 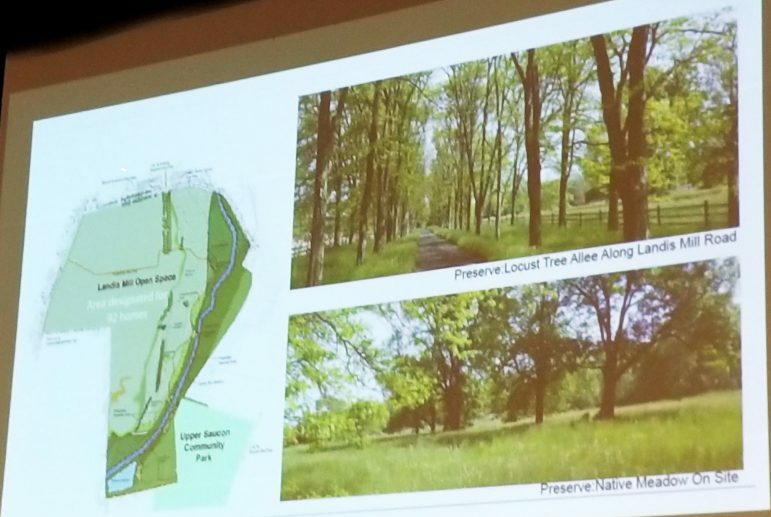 It is also contiguous to Upper Saucon Township Community Park and contains a historic allee of locust trees that could be lost if Kay builds the 95 single-family homes it has approval for there. 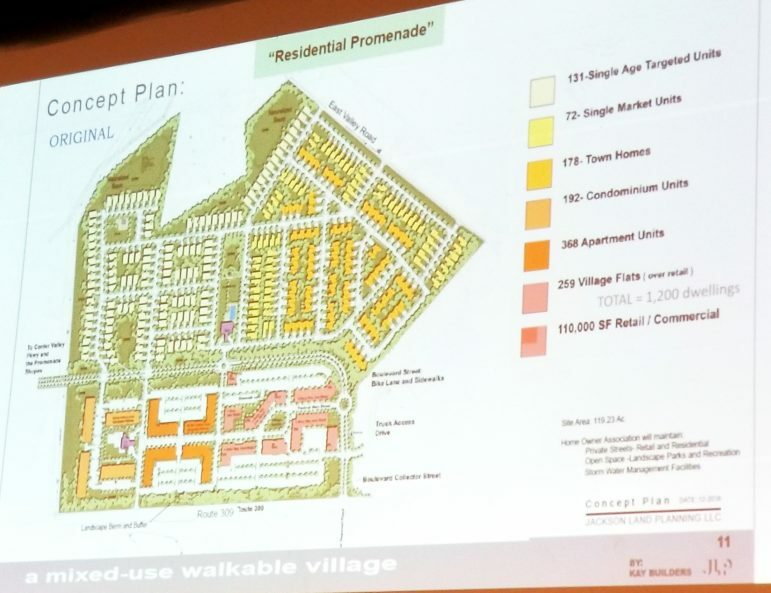 That plan is different from an earlier proposal by Kay, who in early 2017 brought a mixed use walkable retail development plan to the township that would have included 1,200 dwellings and approximately 110,000 square feet of retail/commercial space. It was that plan that prompted Upper Saucon officials to begin work on a mixed use zoning amendment over a period of about 18 months. 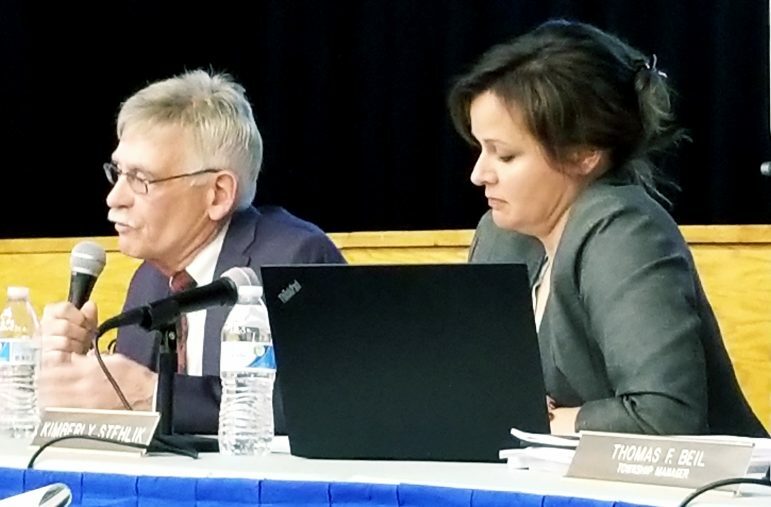 About 60 percent of that amendment draft was ultimately completed before “there were differences between township staff and Kay,” Dinkelacker said. 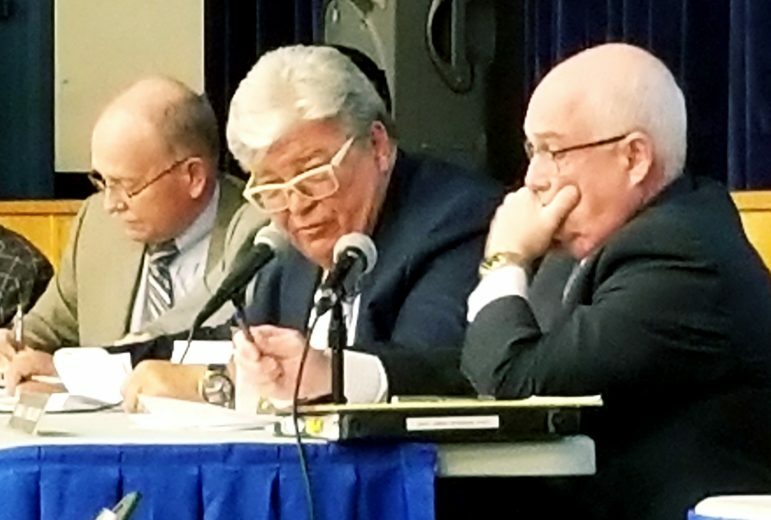 Moving forward with the completion of the draft amendment–which would require that a public hearing be held before supervisors could approve it–is one of the township’s options at this time, Dinkelacker noted. 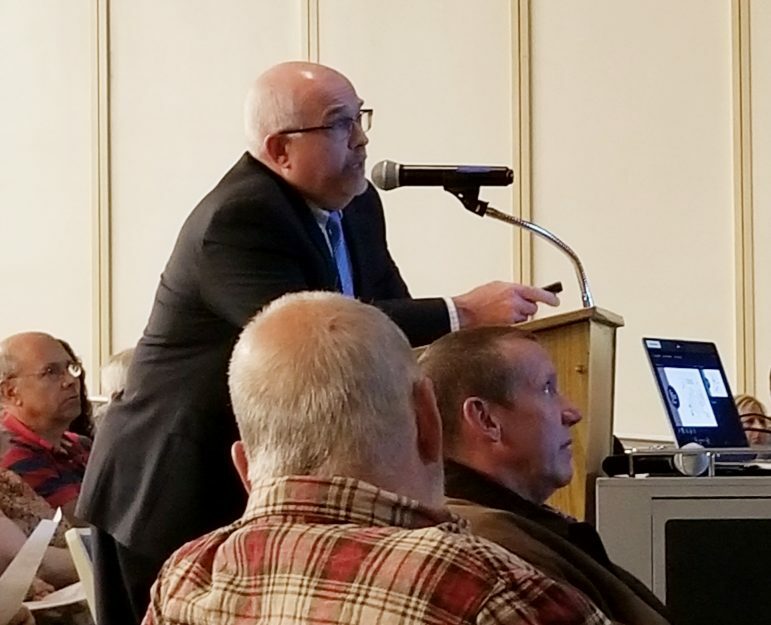 However, supervisors did not entertain voting on that option at the meeting, after Benner and residents criticized Kay for failing to present the township with a detailed proposal. Benner, however, said he was “angry” with Kay. “I almost want to apologize to the community to bring them out this evening to not hear more,” he said, after which a woman in the audience shouted “thank you!” and applause broke out. Benner went on to say that he is concerned about the aesthetics of the proposal, but poorly-conceived aesthetics were not what other supervisors and particularly residents said they fear most. “What is this going to do to our school district?” was a question asked by supervisor Kimberly Stehlik that was later echoed by many residents. Upper Saucon Township supervisor Philip Spaeth speaks at Wednesday night’s meeting. Supervisor Kimberly Stehlik is pictured at right. Resident Lisa Johnson wasn’t shy about saying she doesn’t, either. Johnson was the first resident to speak at the meeting, and she did so in dramatic fashion, unrolling and holding up a handmade sign that read “What About the Wild Animals?” as she approached the speaker’s podium. Upper Saucon resident Lisa Johnson was the first resident to address the board of supervisors Wednesday. Johnson said she is also concerned about the stormwater that will be generated by the project and where it will end up. She said Upper Saucon Township already has stormwater issues because of the Liberty Village development, which she said cause upper portions of Main Street near Coopersburg to flood when it rains heavily. Referencing the grocery store that is proposed as part of the development, Johnson noted that the township currently has a shuttered grocery store: the former Weis supermarket on Rt. 309, which closed in January. She also spoke about Upper Saucon’s significant population growth over the past 20 years. According to U.S. Census data, the population of the township increased from 11,939 to an estimated 16,462 in 2016. “Why can’t the other townships take on these kinds of developments?” Johnson asked. Recent transplant to the area William Ostroski said he is “all about development,” but as a teacher he’s also concerned about how the development could affect enrollment in Southern Lehigh School District. Kyle Romanick asked why the township isn’t able to require developers to build schools to serve the families their homes will attract, which is what he said is being done in South Carolina, where he recently lived. A Center Valley native, Romanick asked what will happen to the Bell property if the current Rt. 309 plan isn’t ultimately approved. Kay attorney Jim Preston wouldn’t comment on that, but Dinkelacker said that in all likelihood the approved development with 95 homes will be built. 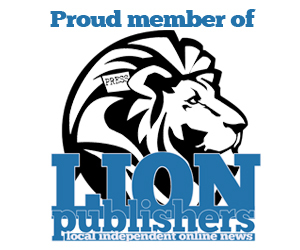 “A decision should be made in fairness to the landowner,” it said. 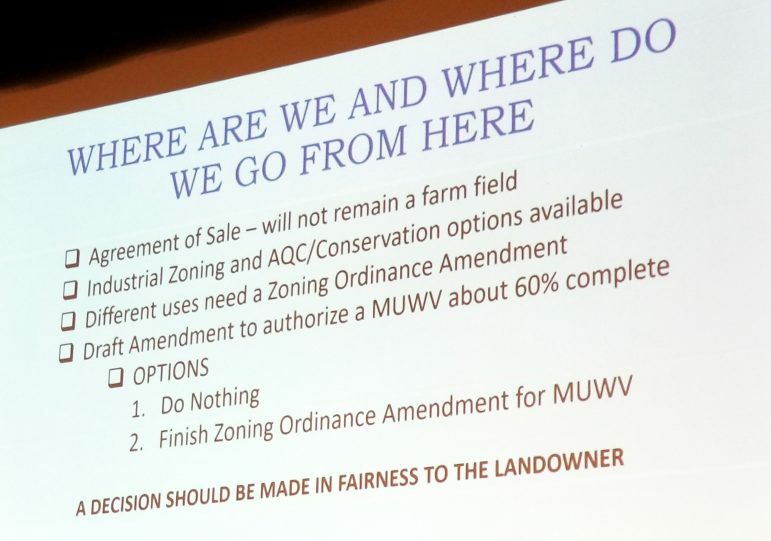 Several residents were critical of the statement that was included at the bottom of this township infographic, that “a decision should be made in fairness to the landowner,” meaning Kay Builders. Joan Slota, who said her family has lived in Upper Saucon since 1959, asked supervisors about fairness to all of the other township landowners. “You allow more people coming in here, you’re going to have problems,” she said, adding that the resources of the Upper Saucon Township Police Department and its volunteer fire company are already stretched thin. A resident who identified herself only as “Laura” said that although the proposal includes new shopping destinations, apartments and amenities, supervisors shouldn’t assume that younger area residents are in favor of it. She also suggested that the township consider an additional levy on earned income to help support the preservation of open space. Lower Saucon Township has such a tax. In 2016, it was reapproved by voter referendum. As the evening grew longer, the criticism of Kay Builders grew stronger. 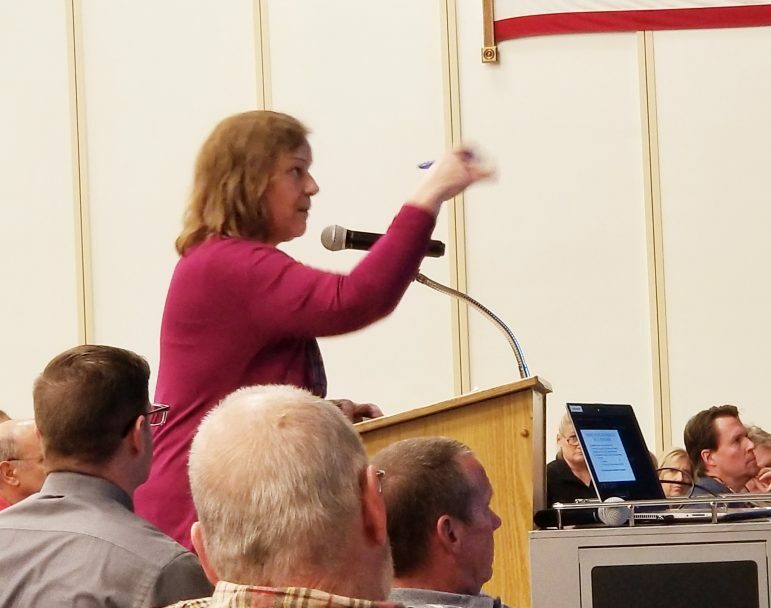 Pat Damico called the company “arrogant” and “callous” with “a total lack of knowledge,” and said those descriptions have been used by residents since Kay’s presentation to the Upper Saucon Township Planning Commission. The plan for the Bell property development, which would include 95 single-family homes at Old Bethlehem Pike and Landis Mill Road. 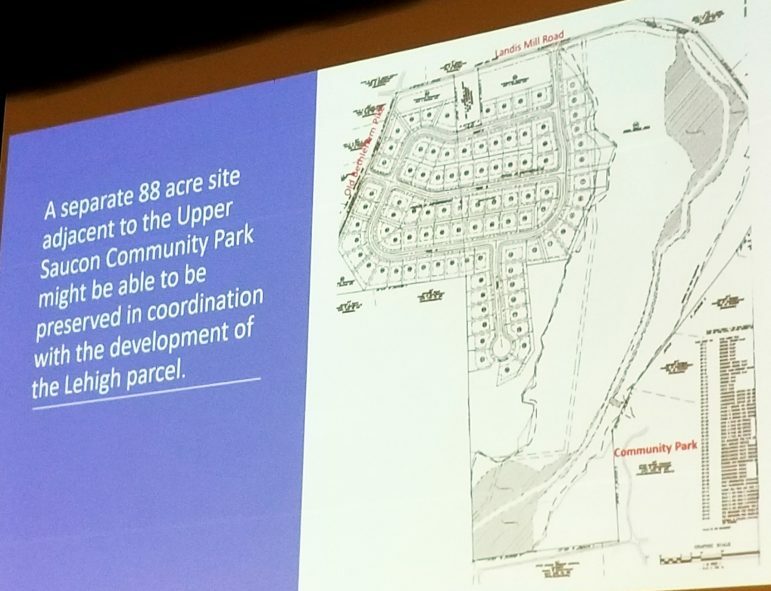 It resulted in a unanimous recommendation by the planning commission that the zoning for the parcel not be changed to accommodate the development, as well as a list of concerns that were identified in a March 14 memorandum to supervisors from Upper Saucon Township Director of Community Development Trish Lang. Click here to read the list. In an April 5 news story published by the Morning Call, Koze seemed to indicate that he would likely pursue building warehouses on the parcel, due to lack of public support for the retail-residential proposal. “I sincerely hope the people of this township will stand firm and stop this insanity,” said Barbara Tantaros, the Upper Milford resident. 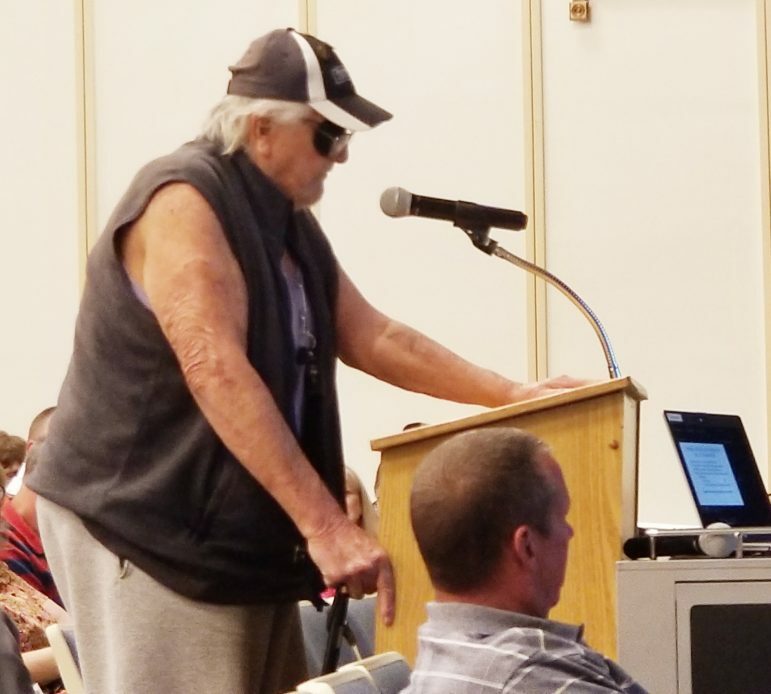 A resident who said he has called Upper Saucon Township home for 85 years told supervisors, “let’s do something about the roads here” before more development occurs. “Your voices are important,” Benner told the meeting attendees. 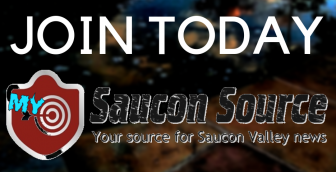 The next meeting of the Upper Saucon Township Board of Supervisors will be held Monday, April 22 at 6:30 p.m. at the municipal building, 5500 Camp Meeting Road, Center Valley.